"The foodstuffs of the dwarves are widely considered to be an acquired taste: acquired, that is, by deciding eating them is just barely preferable to starving to death and/or resorting to cannibalism. Take for instance the common Plump Helmet, an invasive purple fungus that grows voraciously underground, and is staple of most dwarven diets. Those unlucky enough to have tried this 'delicacy' generally liken it's taste and texture to "decades-old loincloth leather soaked in cat urine". 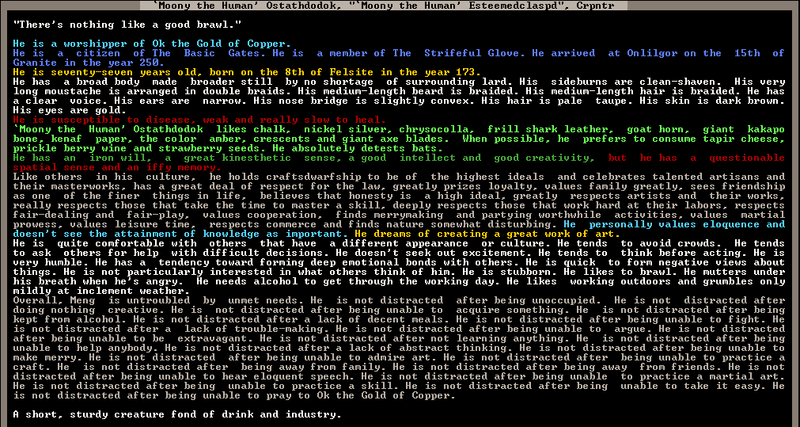 It is perhaps unsurprising, then, that the dwarves habitually blunt their already underdeveloped senses with alcohol. Certainly if I was frequently forced to consume their dishes I would wish to be equally inebriated." Oddom Relicgang, the dwarven queen of The Basic Gates finished quoting the book in front of her and closed it, raising an eyebrow at her husband Rigoth over their private dinner table as she lifted a fork to her mouth. "An insult to dwarves everywhere!" Rigoth said, thumping the table. "This will not stand. I will mobilize the assassins at once!" "Hold, husband. It is not an insult without some merit," said Oddom, chewing her food thoughtfully. "You must admit there is a certain... cat-like aftertaste. Waiter? What is this dish?" “At once, your majesty,” said the waiter, bowing deeply. Rigoth noted the glint in his queen's eye and smiled grimly. "What exactly are you planning, dear?" 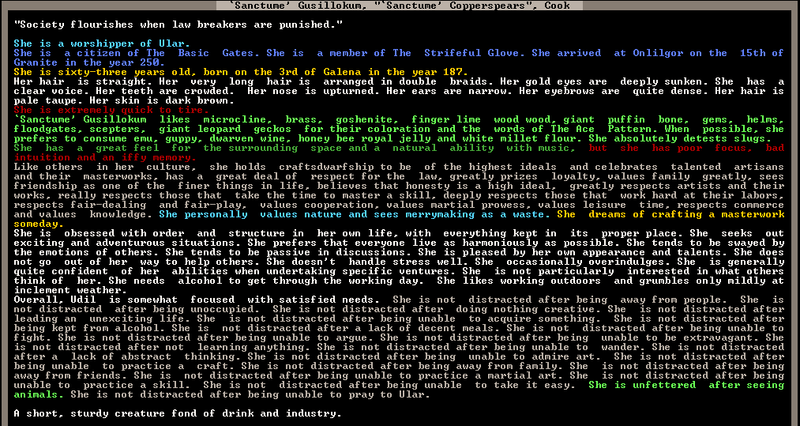 "We are going to rewrite the chapter on Dwarven Cuisine." This was originally intended to be a standard 2-week 1-year succession fort with a goal: export as much quantity and variety of food and drink as possible. ... things did not go according to plan. 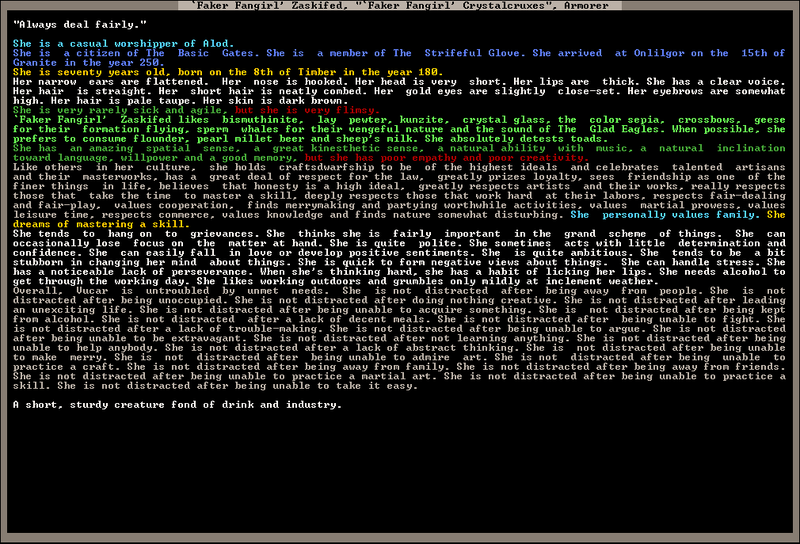 Beset by werepigs, undead goblins, necromancers and a bunch of murderous alcoholic midgets, producing food has become a secondary goal to simply surviving another year in our "peaceful farming settlement". * Trade all your food and drink to every caravan. - After every trade, you should have no edible food or drink left. - Humans are considered couriers delivering to the Mountainhome. Elves do not exist in this world. * No buying food from the caravans. - You'll need to produce your food, not buy it. * Underground crops are not allowed. - Enclosed crops (aboveground crops underneath some sort of roof) are allowed, on one condition: the roof must be made of glass. * Report the export value of each trade you make. - We will use trade value as a proxy for quantity, since it's so much easier to measure. 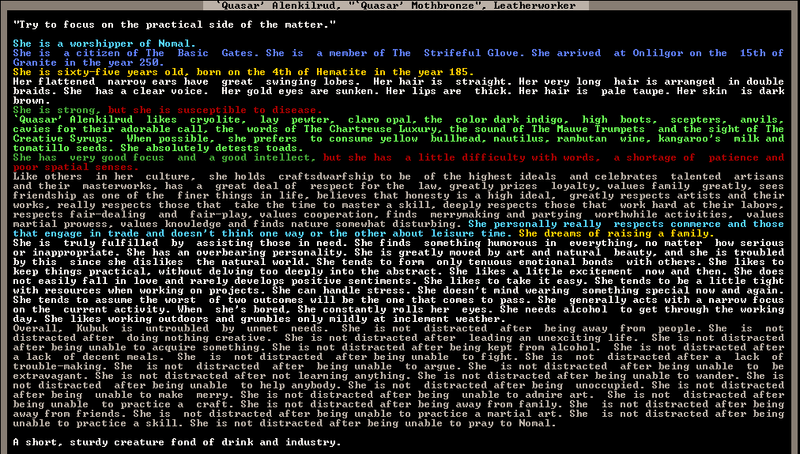 - For plot purposes, our goal is to feed all 4899 dwarves of our civilization. This will take approximately 80,000 units of drink (400,000☼) and 40,000 units of food(4,000,000☼). 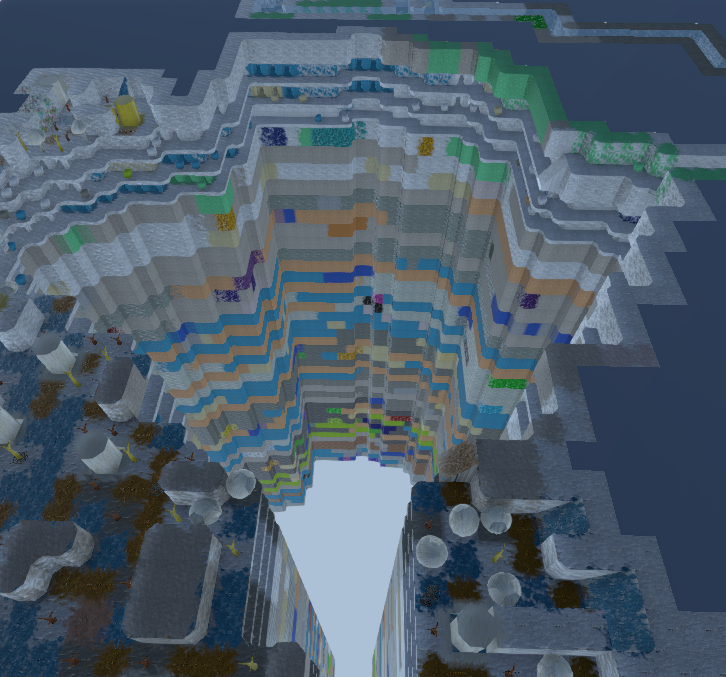 - This way, each overseers trade quantities won't be influenced by food stockpiled during winter by the previous overseer. - Duration: 1 year or 2 weeks, whichever comes first. - Turns will be skipped if you fail to respond or stop updating. - Extensions past the 2-week point will be granted if you put a lot of work into high-quality updates. - You can use graphics sets, but for convenience's sake the save should always be converted back to ASCII when passing turns. - You can use your own judgement on what is and is not an exploit, but stay away from obvious hacks. Maintain the suspension of disbelief! - Using utilities to simplify the game or recover FPS is fine. Anything the LazyNewbPack does by default is fine. - Check with me if there's any doubt. 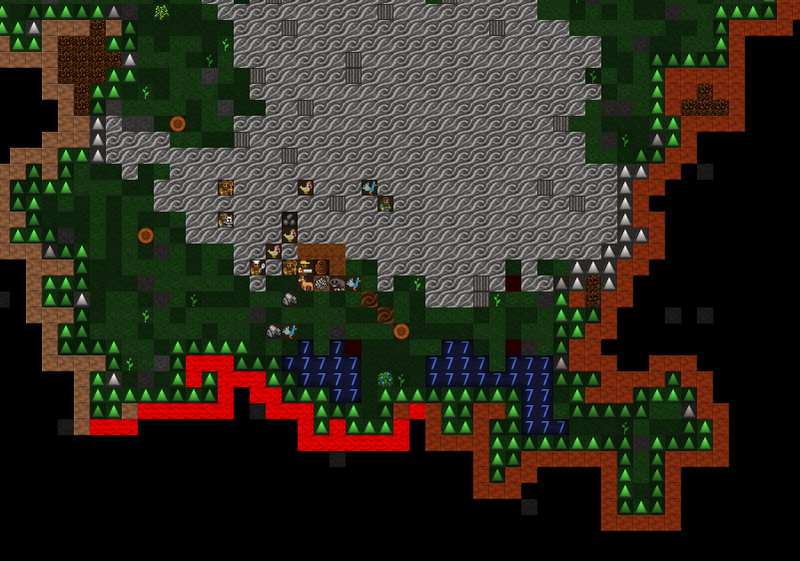 I'll sign off on making creatures war-trainable or increasing merchant animals carrying capacity. - Anything that involves changing dwarf stats or killing specific targets is cheating and thus completely unacceptable. Same goes for fastdwarf, reveal-all, etc. - Savescumming is acceptable in moderation, but don't overuse it: from a narrative standpoint, the occasional massacre or accidental drowning is a good thing. * pasture a breeding pair of as many types of animal as possible, with an emphasis on rare and exotic meats. For dorfing or a turn, ask and ye shall recieve. You may be redorfed after death, but you'll need to come up with a new name. No resurrections, body-hopping or suspiciously similar distant cousins please. Species: Artificial Life, Real Evolution. An emergent evolution simulator. What's the worst that could happen? Time to make farms! Moony apparently armed himself at some time. He got hold of some poor soul's sock and started bashing shambling corpses with it. Oh yeah. A large pig twisted into humanoid form with glowing eyes beating on a shambling corpse with a sock. I now know why I fear the night. Year 1: We built some farms! Year 2: Luckily for the survivors, the corpses of several of our founding dwarves rose from the dead as anti-life abominations in order to avenge themselves against the founding dwarf who had transformed into a sock-wielding pig-monster and murdered them all. If our goal is to grow crops and dance around the campfire singing kumbaya like Breadbowl, then yeah PERHAPS EMBARKING IN A DESERT OF ZOMBIES WASN'T SUCH A GOOD IDEA. Technically it's a shoreline of zombies. Which is why it was a great idea! I don't like summer. It is really hot, I get sweaty all the time and have to take bath every month. 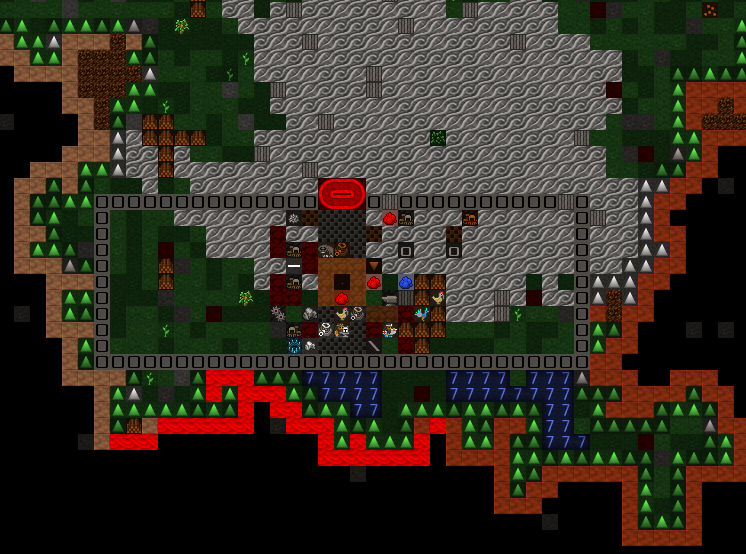 And the pile of corpses in front of the longhouse smells worse than usual. [...] She is a widow. [..] dreams of raising a family. Weren't we supposed to be a farming fort? Oh, that Ushrir kid that was walled in from lack of leather-strange mood--it's in a white sand workshop; so we have a zombie (3 year old kid) there, survived by a 4 year old orphaned sibling. Akko has gone into a fell mood, grabbing 'ace' and killing him before dragging the corpse to a carpenter's workshop. also. Hydrangea started tantrumming in the middle of making a crime report about someone tantrumming. which was fairly amusing. One week later we are angry again. Someone peeked into the water system. It was crudely-engineered and open to the outside. What if the dead come through it? There is also a dead baby in the pipes. Dead babies should not be in pipes. Dead babies should be in dead baby cribs. The MEGASHAFTtm is a alternative trapped entrance to the fort, and will be built upon an 80z natural cavern shaft exacavated by miners. Such a deep shaft is an extraordinary find, and a fall from full height would be more than enough to destroy even the hardiest of creatures. The main route will be a three-story snaking path across the lip of the MEGASHAFTtm. Make the bottom a place to eat, have some nest box around, some pig to butcher, and maybe olive oil, potato to hash and brown, and call it breakfastpit. Oh I'm in. But my next 2 to 3 weekends are booked. So put me on the 3rd or 4th turn please? Sign me up. But I'll only need 4 days for my turn. I nominate settling near a river. I'm up for this, sign me up, please! As for embark preferences.. Clay is a must have. If we're going to build above ground, we need bricks. Okay you bunch of useless sods! Our expedition formed at the insistence of the Queen herself, so listen up. We'll be arriving in less than two weeks. The cartographers found us a, uh... let's say 'good'... embark site. 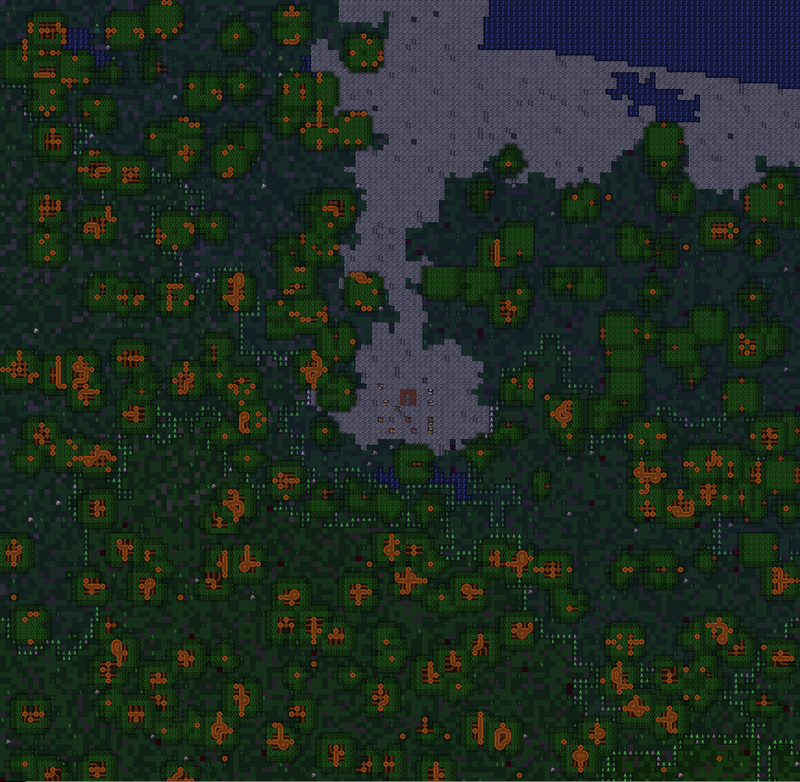 It's on the border between a tropical and temperate biome, so we can plant the widest variety of crops possible. It's also on a coast line of a perfectly ordinary ocean, so get used to the idea of crashing waves and the clean sea air. We will be embarking with one or two or all types of seed bags. Now, making room for all of these seeds will mean leaving some stuff behind, like weapons and armour and picks and competent dwarves. That's fine. We are farmers, not warriors. Glory for us does not mean crushing our enemies, it means feeding our own the most magnificent cuisine imaginable. Finally, early scouts have come back with maps of the fortress site. Familiarise yourself with them: this location will be your new home. OOC: I haven't embarked yet: that last image was from when I was scouting the area and making sure it was viable. 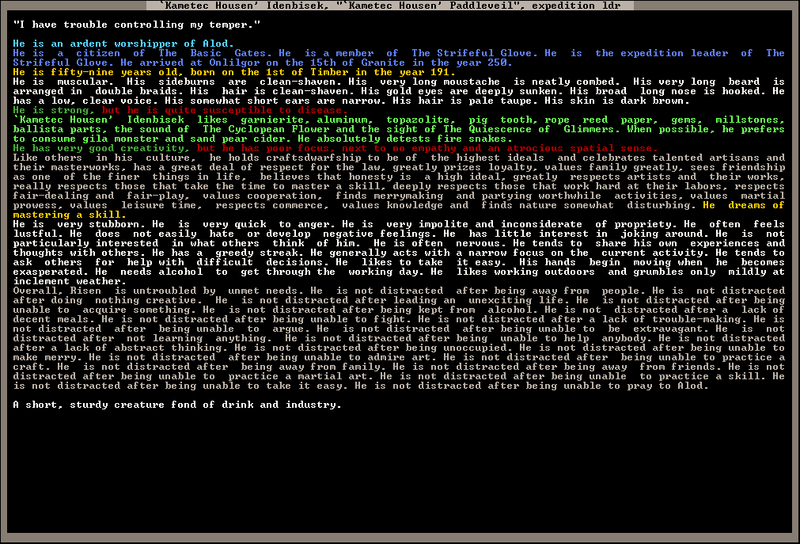 I will wait for all 7 founding dwarves to be spoken for before I actually begin the embark. The location itself is split by the sand coming in from the water: the terrain to the left of the sand is temperate while the terrain to the right is tropical. You can spot the border between them if you pay attention to the stone pebbles between the grass: white dolomite on the left, brown mudstone on the right. I did cheat a little to confirm that the aquifer can be penetrated without needing to rely on the double slit method (it can), but otherwise haven't explored anything more than the surface. I don't know what effects the evil ocean has. We will have to be careful with our butchering until we know if it raises the dead. Also, we don't have elves: as far as I can tell, they have never even existed in this world. On the bright side, this will save us the hassle of having to filter out wooden containers. I have dibs on the Bookkeeper. If you want one of the other founders, let me know! Read Breadbowl, and this looks like !!fun!! The Urn-Ocean of Snot. Gotta love the name! Out of these 7, I'd like to take a planter and do some milling as well. Just please, please pick a dwarf who doesn't dream about creating a masterpiece for me. Requires Coca-Cola to get through the working day. All i need is to be a male. ACCUSE THE WALLS OF BEING COMMUNISTS. This is the place the cartographers selected. Over there is the Urn-Ocean of Snot, a strange but fertile sea, and we stand upon the very border of tropical and temperate biomes: It should be possible to plant and grow a great variety of food here. I have formed friendships with my travelling companions on the trip out: indeed I believe we are all friends with one another. It is good that we get along so well: we will be spending a lot of time in each others company in the future, and it would not be practical to be griping at one another. In my capacity as bookkeeper, I will here record here some details about my friends and companions. We are all dwarves of The Basic Gates, and as such we all share the same pale brown hair, golden eyes and dark brown skin. My name is Quasar Mothbronze. I am a woman of 65 years with very long hair in twin braids, and a bookkeeper with some leatherworking skill. With that in mind, I bought some naked mole dog leather along: I am certain I can use it to make some quality armour to protect myself and my companions from the dangers of the wilderness. I am told I have a good heart, and that I tend to laugh a lot, perhaps a little too often. That said, I do have a little difficulty with the spoken word, hence my preference for the written. I love cavies for their adorable call. I do hope there are cavies out here. This is our expedition leader, and farmer by trade, Kametec Housen Paddleveil. A large, muscular and extremely religious man of 59 years with very long mustache and beard under a bald head, he is a proficient grower with some milling and musical skill. He has quite the temper, is very stubborn and impolite, and may actually be a clinical sociopath. All in all, his god has seen fit to bestow upon him quite the unpleasant personality. Luckily, he is not a stupid man and always willing to ask for help from those around him, which makes him easier to get along with than you might expect from the above description. He ardently worships Alod, the god of Order, Duty and Healing. Our armourer, Faker Fangirl Crystalcruxes. She is 70 years old, with neatly combed short, straight hair. 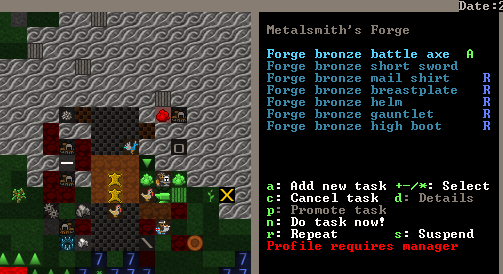 Our expedition was exceedingly lucky to get a dwarf with any metalworking skill at all, so we didn't inquire further about her background. Her skill and talent are quite impressive, though perhaps slightly less impressive than she herself believes them to be. Upon learning that we would have an armourer joining us, I ordered some spare cassiterite, malachite and charcoal with the expedition funds. It will take a few days to smelt it all into bronze, but we would never have been able to afford bronze armour and weapons. I'm quite proud of that little trick. Sanctume Copperspears, a woman 63 years old, and our cook and herbalist. She has hair like mine: waist length and tied in double braids. I am certain she will be kept quite busy in the days ahead. She is obsessed with order and structure in her life, which will hopefully prove to be a boon more than a burden when it comes to organizing what is likely to be a significant workload. Our carpenter, Mooney "The Human" Esteemedclasped, an absolutely massive man of 77 years, with average beard and hair length and an extremely long mustache. In spite of his overwhelming size he is a gentle man with no self-esteem to speak of: he mostly tends to avoid crowds, ask others for help, and think carefully before acting. Drink changes him however: he has mentioned thoroughly enjoying the occasional drunken brawl. In spite of this, I consider him among the most level-headed and self-aware of my companions. Planter and Thresher, Lunardog Tacticcity is a large, extravagant man of 62 years. I am quite certain he has never trimmed his hair, sideburns, mustache or beard: they are so long they render his face invisible behind a neatly combed fall of pale taupe strands. A magnificent image! ... is what he thinks, anyway. 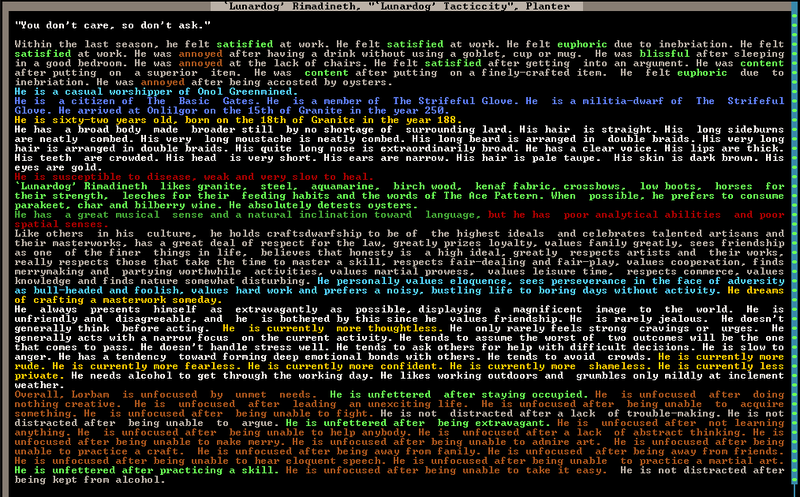 Perhaps not the brightest dwarf in the mountainhome, but a competent planter and preparor of harvested plant stuff. OOC: I will add bio's for our swordsdwarf and planter/thresher when someone claims them. In addition to the dwarves, we also have Turkeys and Peacocks, and of course the horse and water buffalo that pulled the wagon. Hopefully we will be able to build enclosed pastures to keep them all safe from local predators (and worse). Do we still have the rule where above-ground farms covered by ceilings may only be covered by clear glass (not green glass)? Wasn't there also a no vertical farms, i.e. muddied stacking floors? Muddy is fine, so long as there aren't any other farms on another z of same x-y axis? We have sand, so magma-glass furnace will make our food container profitable. How to account for food and drinks before and after trading again? Something about the normal and red text. Screenshots is a must, I say. Are we allowed to buy food from trade? Maybe just allow buying food from non-dwarves? We only trade food so value / profit is not including other non-food, except containers. Still no underground farm allowed? Sanctume likes dwarven wine! But that's ok, it's only food/drink preference. The image for Moony is broken. Moony, why haven't you cut down that tree? What do you mean you can't? Yes, I know that's a training axe. Yes, I know it's made of wood. So are the trees you're cutting with it. So what if it doesn't have an edge, it's an axe isn't it? I don't understand. 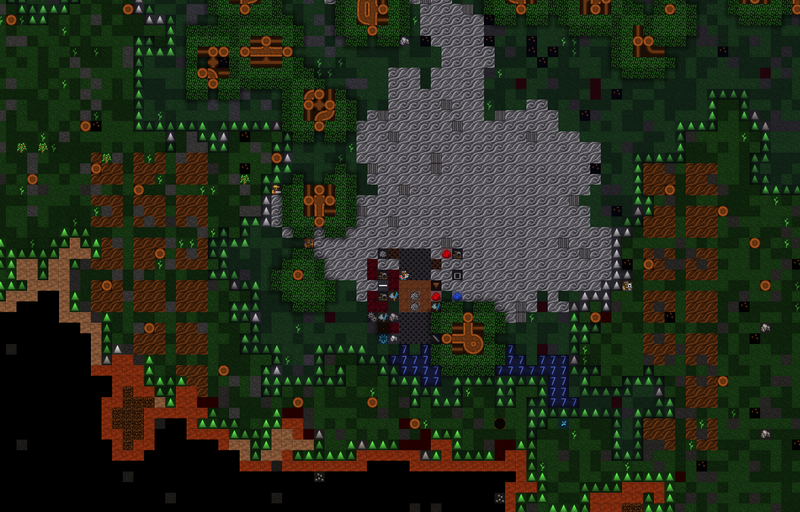 I know dwarves can cut trees with training axes, I've seen it before. Okay, fine. Fine! You're the expert, I'll take your word for it. So, what do we do now then? We have no picks, we can't dig. We have no axe, we can't cut wood. Faker, could you make Moony a nice bronze axe once you're done smelting? Moony sets out with a brand new bronze axe, still warm from the forge, and the trees at last begin to fall. We will now begin work on a longhouse to which we can retreat in an emergency. I'd like to request a dwarfing! Female cook, or brewer, or armoursmith, if you would. Named "Hydrangea". I'd like to confirm that we're playing unmodded 44.09, right?